As the world financial markets watch the Plunge Protection Team shovel US taxpayer dollars into the flames of reality, propping up the stock markets in a gravity-defying display (I would bet on gravity to win), it is becoming obvious to all that the debt-based currency system of the private central banks, while quite profitable for the bankers, is a dismal failure for civilization as a whole. Humans have labored under this failed experiment for almost 400 years while the media proclaims this is the only form of banking possible. Leaders who say otherwise are assassinated while nations trying alternatives are invaded. As a means to great wealth for little effort, private central banking using debt-based currency is a marvelous invention, although contrary to the devotees of Adam Smith, this elaborate exercise in personal greed has not advanced civilization along at all. Quite the contrary, any advances made have been in spite of the extreme hindrances and burdens placed on the world at large by the private bankers. Modern economic theory, usually bought and paid for by those bankers, strive to reconcile the revealed dogma with the ever-growing evidence that the system is deeply flawed and should be abandoned. In this, said economists are not unlike students of epicycles, who strove valiantly to reconcile Galileo’s observations suggesting a heliocentric solar system with the church’s enforced-by-torture geocentric dogma. The fact is that this model of a private central bank creating money out of thin air to loan to the people and governments was the very economic system this nation fought a revolution to be free of. While our schools teach us of tea parties and stamp acts, they rarely mention the Currency Act any more, even though it was the primary reason for the revolution. The American colonies issued their own currency, which existed in ample supply to ensure full employment and prosperity for all. But when Ben Franklin described this economic paradise while ambassador to London, the Bank of England panicked! England was even then in the grip of monumental poverty for the masses brought on by the predations of the bankers, and the Bank of England feared that if word of an alterative system reached the people, riots would be the result. So, the Bank of England lobbied King George III to pass the Currency act which ordered the colonists only to use banknotes borrowed at interest from the Bank of England. It took only a few years for this Currency act to reduce the American colonies to the same level of poverty and starvation as their English brethren. 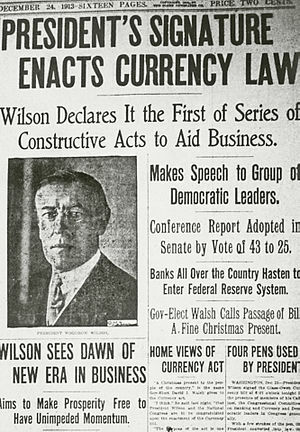 Naturally our schools stopped teaching about the Currency act the same time the Federal Reserve system was brought into being, to obscure the fact that we had all been returned, courtesy of a corrupt Congress and a corrupt President, into the clutches of the very same sort of banker slavery we had fought a war to be free of. More and more citizens everywhere cry for a return to the economic system that worked best for the people. They yearn for a government issued value-based currency such as this nation was started with. But should we return to a gold standard? Throughout history, many materials have been used as a medium of exchange. Primitive people used shells, Arabs used salt (origin of the expression “the man is worth his salt.”) , and during the last Great Depression a town newspaper printed up their own promissory notes good for free advertising in the paper and used them to barter goods in the town. These ad-based currencies came to be more trusted than the US issued dollars! Germany, when freeing itself from the private central bank imposed by the Treaty of Versailles, redeemed their value-based currency in units of labor. The result was the German Miracle that so terrified the private bankers they organized a boycott to destroy the new German economy before other nations decided to copy it. World War 2 was the result. More recently, Libya established a state-controlled bank issuing a value-based currency, the Gold Dinar, which was gaining in popularity across Africa. Invasion followed. Even in the United States, we have had three Presidents try to pry the nation’s finances back from the grip of the private bankers, Andrew Jackson, Abraham Lincoln, and John F. Kennedy. Of the three, only Andrew Jackson succeeded in shutting down the bank. He is also the only US President to pay off the National Debt completely. There was an attempted assassination shortly afterwards, with a confession that clearly indicated a financial motive for the attempt. Both Abraham Lincoln and John F. Kennedy used Article 1 Section 8 of the Constitution to issue government currency that did not pay interest to the private banks. Both men were assassinated and their interest-free money destroyed. In Kennedy’s case, a banker, John J. McCloy, President of the Chase Manhattan Bank and President of the World Bank, was appointed to the Warren Commission that whitewashed the circumstances of the assassination. So, should we return to the gold standard? To be useful as money, the medium for exchange must be something that is universally agreed upon to have value while at the same time existing in enough supply to prevent manipulation by the money-junkies. In arguing about a new value standard for money one detractor argued that gold was the only possible basis for a new monetary system because only gold was universally valued. Obviously, that is not true. One could walk into any nation carrying a gallon of gasoline and find someone willing to trade for it. So clearly, other mediums of exchange are possible, even if we did not have prior history to assure us if their validity and success. The problem with gold and silver as mediums of exchange is they exist in too small a quantity relative to the growing population. Gold and silver can be manipulated, hoarded, and shorted, to make the speculators rich at the expense of everyone else. Most of the existing gold and silver are already in the hands of the very same bankers who wrecked our present system, so moving to a gold standard merely trades one form of banker-slavery for another. What is needed is a medium for exchange that increases in supply right alongside the population itself, in order to maintain stability and constant value. So, my suggestion is to use electricity as the universal basis for a new value-based money system. For the purposes of discussion I call the new US monetary unit the “Lectro.” It is redeemable for one kilowatt hour of electricity. The reason I think this is an idea worth pursuing are as follows. 1. While the US Government will have a motive to create electrical power in order to redeem the tokens (coins) and claim checks (Lectro certificates) issued for commerce, creation of electricity and hence money cannot be monopolized. There is no central issuing authority. Every home can have solar panels generating power to the grid, which is redeemable in Lectro notes. In a way we already do this when we pay for power for paper notes and for those able to sell power back to the utility, trade generated power for notes back. This is simply taking the idea to a national scale and making it the de-fact monetary system. and because everyone can generate electricity, artificial scarcity of supply cannot be created. 2. Because power is now the actual monetary system, this approach encourages efficient (and with the proper tax penalties for pollution) clean power generation as well as conservation at the consumer and factory levels. 3. Nobody can short the money supply because everyone can create their own power and monetize it through the treasury. Runaway inflation is impossible because all the coins and certificates in circulation are tied to the available power grid. As power is created, coins and certificates flow into circulation. As power is used, the coins and certificates are taken out of circulation. 4. In the long term, creation of an energy-based money system will smooth the transition from a human-labor to machine-labor society. At present, human labor precedes all capital, payable in a monetary system that pays primarily for human labor. In switching to a monetary system that pays for machine based power production, we evolve towards a society where machines become the primary creators of capital, and all humans shift towards the demand side of the economy. Instead of creating poverty, the push towards automation creates more wealth. Great article! End the Fed! Thanks for your comment Patrick.